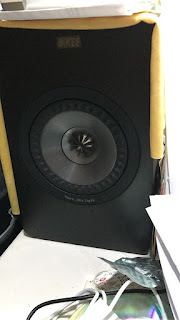 KEF X300A review An audiophile's desktop computer speaker The term computer speakers covers a wide variety of equipment, and we have come a long way from using built in speakers on a laptop to fancy hi fi based setups that can cost upwards of a few thousand dollars. You can get sound from a nasty $50 pair of plasticky speakers, or you can hookup up your regular stereo system or even a home theatre system to your computer. Whichever way, one key principle is that, crap in garbage out. So use the best source you can. Lossless music will sound better than mp3 and other compressed sources. If you are willing to go beyond the usual self-powered stuff you see in computer shops, the audiophile slanted companies such as Dynaudio, B&W and now KEF have offerings which do cost more but also offer more for the music orientated computer user, who doesn't want to put up with inferior sound, but doesn't want to clutter his desktop with a whole stereo system.